It’s not even summer driving season yet and gas prices are already climbing. Prices at the pump have increased 52 cents this year, and now stand at an average of $3.81 a gallon, surpassing $4 a gallon in several states and pushing uncomfortably close to the all-time high of $4.11 set in July 2008. Pundits are predicting gas could hit $5 a gallon before the end of the year. Frustration is rising along with the cost of oil as Americans look for someone to blame. Fingers are pointing in all directions: from Iran to China, Washington to Wall Street. In a recent national survey by the Pew Research Center and The Washington Post, when asked who is most responsible for rising gasoline prices, 18% of Americans pointed to President Obama and his administration, 14% fingered oil companies, 11% chalked it up to tensions with Iran or the threat of war or upheaval in the Middle East, and 4% pegged it on speculators or excessive Wall Street trading. There is no single cause for oil to rise, say Wharton professors and energy experts. 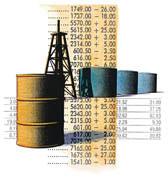 Overall, fluctuations in oil prices boil down to supply and demand. The world is “pushing up against what’s available in terms of producible oil,” says Robert Ready, a finance professor at the University of Rochester’s Simon School of Business who studies oil supply shocks. As oil becomes more expensive to tap and the world demands more of it, there is increasing strain on the available supply, Ready notes. That means a single unexpected event — whether unrest in the Middle East, a pipeline explosion or a hurricane in the Gulf — can disrupt supply and send prices higher. “There just isn’t slack out there,” he says. About a year ago, upheaval in Libya triggered a run-up in oil prices. This year, all eyes are on Iran, which is under pressure from the United States, Israel and Europe to suspend its nuclear research program. In February, a defiant Iran threatened to block the Strait of Hormuz, a narrow passage to the Persian Gulf that yields access to 20% of the world’s oil. Nevertheless, Iran is not the “dominant explanation” for rising oil prices, according to Pack. “More fundamentally, we still have this very rapid growth in China … and India continues to grow,” he points out. According to Bloomberg News, China is building four emergency petroleum reserves and planning to stockpile more oil to help reduce price fluctuations locally. Such growing economies will push demand higher and “will undoubtedly have an impact on oil prices,” Pack says. And that, of course, means higher gas prices for consumers. It takes about two weeks for crude prices to trickle through the distribution stream, notes Avery Ash, manager of regulatory affairs for AAA, the Heathrow, Fla., nonprofit that provides travel and roadside assistance. For every $1 a barrel increase in the price of crude, consumers can expect to see an increase of about two and a half cents for each gallon of gasoline. The price at the pump does not always correspond directly to a barrel of oil. Some price increases for gasoline are seasonal, Ash points out. In the U.S., for example, gas prices increase in the summer because gasoline is blended differently to reduce air pollution. The Environmental Protection Agency requires all gasoline sold after June 1 to be a “summer grade” gasoline, a blend that contains more additives and less butane than winter-grade gasoline. Because of its different ingredients, winter gasoline blends are about 6 cents a gallon cheaper to produce than summer blends, Ash says. Last summer,a rapid increase in crude production in North Dakota and Canada created a backlog at the nation’s oil storage facilities in Cushing, Okla., which funnel much of the nation’s crude to refineries on the Gulf Coast. A shortage of pipelines linking Cushing to Gulf Coast refineries caused the backup, Reuters reported at the time. For a while, the local oil glut pushed the price of West Texas Intermediate (WTI) crude oil, the U.S. crude benchmark, to record levels below Brent Crude, the benchmark for gas prices in Europe, the Middle East and much of Africa. Brent relies on oil from the North Sea and is refined primarily in northwest Europe. The spread between the two benchmarks widened to almost $30 per barrel. Denver currently has the lowest average gas price in the country, at $3.36, according to Lundberg Survey, a Camarillo, Calif.-based company that tracks fuel prices by surveying gas stations nationwide. The highest was Los Angeles at $4.35. Gas prices in California are more expensive than in other parts of the country due to higher taxes and stringent environmental regulations. The “threshold” for such belt tightening used to be $2 or $3 per gallon. Today, the magic number may be $5. On average, Americans say that gas prices of $5.30 to $5.35 per gallon would make them cut back on spending, according to a Gallup Poll conducted in early March. In the same poll, 85% said the President or Congress should “take immediate actions to try to control the rising price of gas,” although only 65% said they believe that government officials could actually do anything to keep prices from going up. As the November election approaches, the discussion has grown increasingly political. Republicans say gas prices are soaring because the Obama administration has crippled the energy industry by blocking or hindering exploration and new energy projects,such as TransCanada Corporation’s Keystone XL pipeline. The White House counters that domestic crude oil production is at its highest level in eight years, and oil imports have declined since Obama took office. Obama has called for a repeal of $4 billion in annual government subsidies to the oil industry and says he is working to prevent speculators from distorting prices. Where do oil prices go from here? That depends on what happens next in the Persian Gulf, according to Bernard Baumohl, chief global economist at the Princeton, N.J.-based Economic Outlook Group and author of The Secrets of Economic Indicators: Hidden Clues to Future Economic Trends and Investment Opportunities. “If there is going to be a military confrontation [with Iran], we are looking at world [WTI] prices moving up to $130 per barrel,” he says. (On Wednesday, WTI Spot was $106.07 a barrel.) A longer, more extensive conflict could send prices to $150 or even $200. It’s impossible to predict with certainty. “There’s so much we don’t know,” he says. President Obama may choose to tap the Strategic Petroleum Reserve if the average price of gasoline climbs above $4 a gallon, Baumohl suggests. In August and January 2011, Obama authorized the sale of 30.64 million barrels from the reserve in response to supply disruptions due to unrest in Libya. With a capacity of 727 million barrels and currently holding 695.9 million, the Strategic Oil Reserve is the largest stockpile of government-owned crude oil in the world. Rising fuel costs are “definitely going to put a dent in consumer spending” if they continue, Baumohl says. “For every penny increase at the pump, Americans spend an extra $4 million a day” for gasoline, he notes. That adds up to about $1.5 billion per year. Within one to three months, an increase in oil prices is reflected in the economy, in everything from higher transportation costs to price increases for petroleum-based products such as plastic combs. “Less than 5% of take-home pay actually goes to paying for gasoline,” Baumohl points out, “But gasoline prices have a much greater psychological impact on consumers because they see on a daily basis how much the price of gasoline goes up. It’s advertised on so many signs.” The uptick in prices thus has a “palpable impact” on consumers, he says.